Why to build gallery in blog content? In common, you can build the awesome blog post with some media files, and sometimes you would like to share lots of images with your friends. Yes, you want to build an album with those images in the blog post content. But it looks difficulty to incorporate display for larger images, which under normal situations would break the layout of this site. It will save lots of our time if there is some way to automatically organized images with clean & elegant layout and we just copy/insert images into Rich-Editor or WLW. Congratulations. The "Fancy Gallery" extension is the exact tool for your dnn blog. 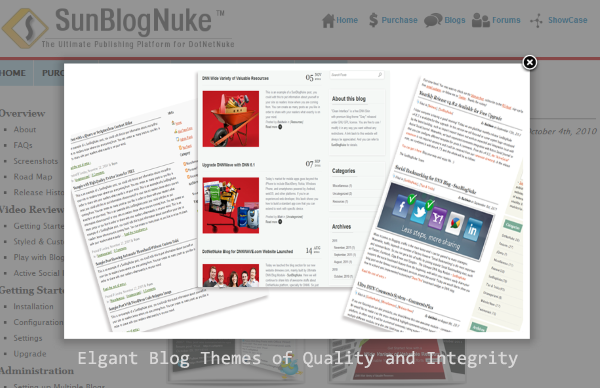 And it is another extension for Ultimate DNN Blog Module – SunBlogNuke. You just feel free to add your images and this extension will do the rest for you – automatically convert them into one fancy gallery with lightbox effect. How this blog gallery extension works? 1) Make sure that you have installed SunBlogNuke v4.8.+ for your DNN blog page. 2) Download it from the extensions directory. 3) Unzip it and upload the extension assembly file SunBlogNuke.Extensions.FancyGallery.dll into the folder $ROOT/bin. Then upload another folder into blog extensions folder $ROOT/DesktopModules/SunBlog/Extensions. 1) Enter "Edit Post" panel (Or connect WLW) and focus on the Rich Editor. 2) Add images with tool button "Insert Image" of editor. Don’t worry about the layout and just make them sequence placed there. 4) Complete other configurations of current post and click "update" to save it into db. That is all. It should work like a charm - when visiting the post detail, you will see the auto-built gallery with your images in your blog post. With a little bit of setup, it is possible to quickly add lightbox image effects to a DotNetNuke site with specific desires to implement it in the Blogging/Articles module for blog/other content. As always, feel free to post comments/suggestions below or if you are having difficulties implementing this on your site you may post to the community forums! « Why vote so low for DNN7 release? I can't tell from this post where I download fancy gallery. Also I don't know what you mean by add a folder to my site root bin directory. I know how to add a folder but what should I name it and what are its contents ? The download link fixed. Thanks a lot for your feedback. As we mentioned above, you need to unzip the extension package at first. Then upload the extension assembly file 'SunBlogNuke.Extensions.FancyGallery.dll' into the folder $ROOT/bin (This folder exists there, not have to create it). 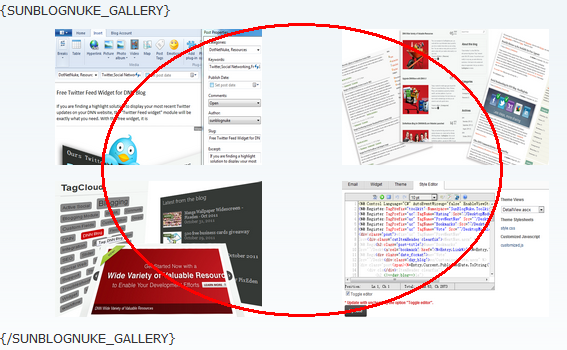 Next upload another folder ''FancyGallery' into blog extensions folder $ROOT/DesktopModules/SunBlog/Extensions. Hope it helps.